This Dometic Polar White Analog Thermostat will control your RV furnace or A/C, with easy to read display, adjustable levers, cool/furnace, high/low, or fan/auto, no matter what your temperature needs this thermostat aims to please! You like your thermostat the way it is, why mess with a good thing? 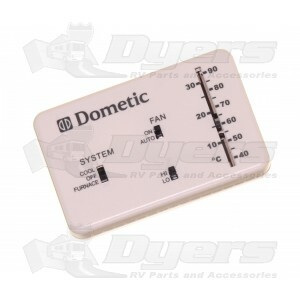 This Dometic Polar White Analog Cool/Furnace Thermostat does its job by heating and cooling your RV with easy to read buttons and quick touch levers your motorhome will be the right temperature in no time! Whether you need a little air or a lot, the options on this Dometic Thermostat put the climate control at the tip of your fingertips! With Cool/Furnace, Fan On/Auto and Hi/Low controls you are ready for winter or summer. This whole Dometic thermostat kit is brand new in the box, with the thermostat, wiring diagram and the 2 screws you need for an easy install. If you have a Dometic A/C model 641416 this Analog Thermostat will fit. If you are not sure if this thermostat will work in your RV, call us with the Dometic product number of your unit and talk to one of our experienced Dometic customer service agents. We will be happy to help you find the thermostat that will keep your RV comfortable, all year long! May fit other applications without a heat strip. Following controls: Cool/Off/Furnace, Fan On/Auto and Hi/Low Controls. Received 2 days after ordering. Easy to install, fit perfectly, even in our 2001 5th wheel. This thermostat was the perfect replacement for my broken one, and the installation was as simple as stated. Super fast shipping! Very easy to install! Works great! I purchased this product to replace a Dometic Analog Cool/Furnace Thermostat. The product was an exact replacement, installed easily, and works perfectly. The price was excellent and Dyer's had it to me within two days. Extremely happy with the purchase.